Now, Forager’s purpose has always been to inspire, share, and grow. My hope has been to provide a space for bakers, pastry, and candy lovers to challenge themselves while also finding new ways to use seasonal ingredients. Coming from a professional pastry background, I developed these seasonal recipes based on measurements of weight in ounces and grams. These weights are exact units of measurement, so they’re commonly used in pastry kitchens in order to create the most consistent product possible day after day. Since my goal is to share with you recipes that will produce the same results in your kitchen as it did in mine weight seemed like the best way to go. However, over the past year I’ve often found myself thinking about writing new recipes in volume measurements of cups, teaspoons, and tablespoons. Especially as my cravings have turned more towards comfort-baking in 2017. Muffins, cakes, and biscuits don’t necessarily require precision to produce great results and volume is commonly used in American home kitchens; which would make these recipes more accessible to everyone. I’ve also been itching for a change to the blog. For the sake of continuity, it didn’t seem like a good idea to switch up recipe styles though. Why confuse people by having a blog full of weight and volume recipe amounts? So, I put the idea on the shelf for a long time. Not anymore. It’s finally occurred to me that it doesn’t matter. 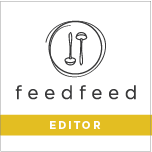 There’s plenty of room on this blog for both types of recipes and after a little online research I’ve discovered that plenty of well-respected blogs use a mix of both. What this means for you dear baker, is that you’ll now be able to pull out your cups and teaspoons for more Now, Forager baking recipes in the future (e.g. muffins, cakes, breads, etc.). When it comes to pastry and confectionary recipes they’ll continue to be written in grams as these tend to need exact units of measurement for the best results (e.g. croissants, pâte de fruit, chocolates, etc.). I’m excited to finally make this change to the blog. Hoping that you’ll enjoy it too! 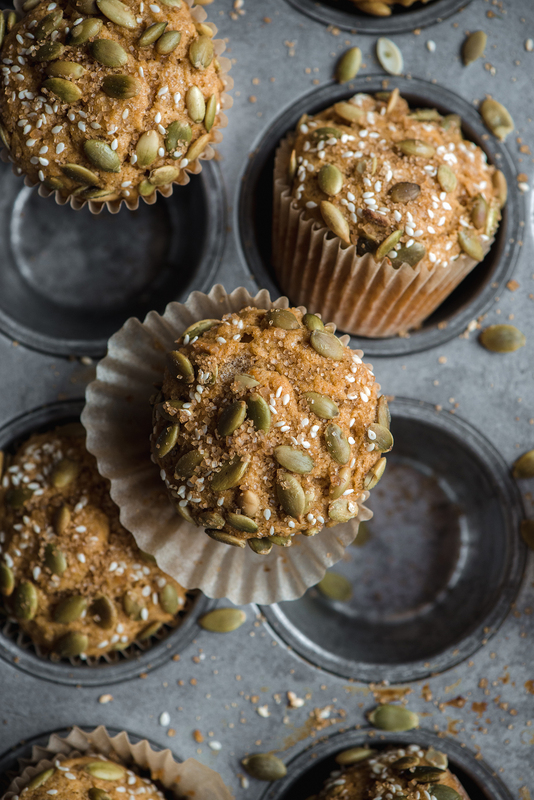 Let’s kick this off with some Spiced Pumpkin Muffins. A cozy fall recipe to make on weekends and enjoy with a cup of morning coffee. *When making any type of muffin there is one very important key step to remember: Don’t overmix the batter. Once the flour is added to the bowl, only mix it in just until combined. Overmixing creates a tough and chewy muffin due to the development of too much gluten during the mixing process. Nerdy baking science fact: Wheat flour contains two certain types of proteins (glutenin and gliaden). When water is combined with the flour these two proteins combine to form gluten. Gluten creates a strong structure; which is ideal when baking loaves of bread, but not so much when you want a fluffy muffin. A light mixing in of the flour will produce the tender muffin that we all know and love. *When filling the muffin cups with batter I like to use an ice cream scoop for portioning. It’s quick, clean, and easy. Preheat oven to 375F (190C). Line a standard 12-cup muffin tin with paper liners. In a large bowl, whisk together flour, baking powder, salt, cinnamon, cloves, nutmeg, and allspice. In the bowl of a stand mixer, fitted with the paddle attachment and on medium speed, beat the butter and sugars until light and fluffy, about 5 minutes. Meanwhile, whisk together oil, pumpkin puree, eggs, and buttermilk in a bowl. On low speed, stream in pumpkin mixture and mix until combined. Stop and scrape down the sides and bottom of the bowl. Add in flour mixture and mix on low speed just until muffin batter is combined. 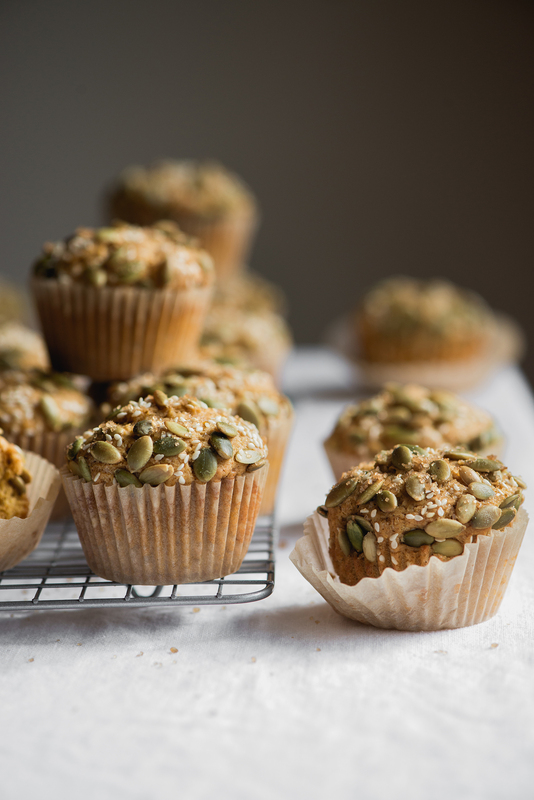 Fill each muffin cup about 1/2-full with spiced pumpkin batter. Generously sprinkle with pumpkin seeds, sesame seeds, and turbinado sugar. Bake for 20-24 minutes, until golden and puffed and a toothpick inserted in the center comes out clean. Remove from oven and let muffins cool in tin for about 5 minutes, then transfer to rack and let cool completely. Serve warm or room temperature. Muffins are best enjoyed the day they’re made. I don’t have a stand mixer, should I mix by hand or will a hand mixer work in this recipe? Hi Anna! Creaming the butter and sugars with a hand mixer will work just fine (also when adding in the wet pumpkin mixture). Only, I recommend mixing the dry flour mixture in by hand to finish it off. That way there’s minimal risk of overmixing the muffin batter. Hope you’re doing well and enjoy! Thanks, Laura! Fall muffins are extra scrumptious. you see in the UK we don’t use cups at all, they’re so inaccurate I wouldn’t like to think my recipe failed because I didn’t measure something. Also how long does it take to measure tablespoons of butter? I find scales so much easier, so thanks for including both. These muffins look absolutely delicious. You’re welcome, Angela! Glad you’ve appreciated the grams. :) Yes, the professional pastry kitchens that I’ve worked in have all used the European standard unit of measurement. I prefer using a scale as well (plus, less dishes- yeah! ); however, in the U.S. home bakers typically use cups and teaspoons. Adding these volume measurements to my recipes is my way of making them more inclusive and convenient to those who don’t use scales. It’s all about spreading the dessert-love to both types of bakers.